Each year, the employee who demonstrates the work ethic and values of the late E. Keith Moore is presented with the award named after him. Mr. Moore continues to have a positive influence on our culture at Hurco. Last Wednesday, Hurco was proud to recognize two employees with E. Keith Moore awards. Wayne Kline, Senior Manufacturing Engineer with Hurco since 2011 and Matthew Ponto, Software Support Engineer with Hurco since 2013 both received 2018 honors during the company’s annual employee meeting. Both Matt and Wayne exemplify the customer-centric attitude that Mr. Moore exhibited throughout his career at Hurco. 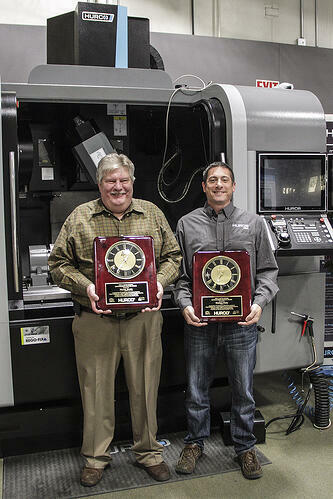 Caption: Wayne Kline (left) and Matthew Ponto pictured with their 2018 E. Keith Moore commemorative awards. "We lost a Hurco legend this year when E. Keith Moore, a retired Hurco executive, passed away. Mr. Moore instilled a customer-centric approach in all of us at Hurco. 'What did you do for your customers today?' was his mantra. Even though Mr. Moore retired from Hurco in 1999, his legacy of sustained customer focus and old-fashioned hard work is part of our corporate DNA. It is the legacy of people like Mr. Moore that keeps us focused to earn the trust of new customers and deepen our relationships with current customers. 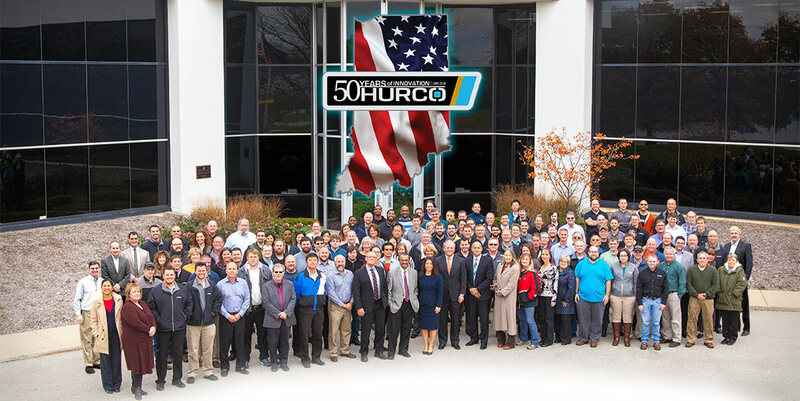 Developing products and technology that make manufacturing more efficient and more profitable for our customers and their businesses is what motivates each employee at Hurco to do their best each and every day to serve those customers. While there isn’t a measurable financial impact to customer empathy, I am proud that caring about our customers is simply part of the culture at Hurco." Keith was born and raised in Brown County, Indiana, where he attended high school and played basketball and baseball. He enlisted in the Navy at the start of World War II and spent most of his time aboard the destroyer USS Morris in the South Pacific. He received nine battle stars and was cited for meritorious conduct after the Morris was hit by a kamikaze plane that killed 27 sailors. After serving in the Navy he returned to Columbus, Indiana, where he resided the rest of his life. He worked for Cosco for 38 years before joining Hurco in Indianapolis in 1978 as executive vice president and chief operating officer, eventually becoming president of Hurco International. He traveled frequently to Europe and Asia where he still has many friends. To honor Keith’s achievements, Hurco presented him with the first annual E. Keith Moore Distinguished Service Award in 1987. He retired from Hurco in 1999. Keith was a charter member of North Christian Church where he remained active. He served as chair of the congregation, elder, trustee, Sunday school superintendent and was on the architecture committee responsible for the design and construction of the current building. He was a strong believer in community service in Columbus. Over the years he served on the board of The Commons, United Way, Junior Achievement, Boys Club, Foundation for Youth and Columbus Area Chamber of Commerce and as chairman of the Solid Waste Disposal Authority. He received the Outstanding Boss of the Year Award from Columbus Jaycees in 1974. Other memberships have included Kiwanis, Jaycees, Harrison Lake Country Club, Scottish Rite, Shriners, American Legion and Masonic Lodge.